You may have noticed black streaks on your pool and patio. These stains are a result of algae, mold, and mildew that grow due to Florida’s humid climate. As a homeowner, you do not want these unsightly stains around your pool and patio. In Florida, pool cages are common due to pool safety requirements. They also provide an effective barrier to keep bugs, debris, and harsh sunlight out. The one thing that screen enclosures cannot repel is pollen. When pollen accumulates over time, it forms an ugly film of grime. Moisture from the pool also causes algae and mold to grow on the aluminum frame. To clean your screen enclosure, you will need a bucket, dish soap, brush with soft bristles, and garden hose. Dipping into a solution of soap and water, brush the screens and frame gently. Rinse with your garden hose and allow to air dry. If soap does not do the trick, mix vinegar with hot water and apply to the problem spots. Scrub away the dirt and then rinse thoroughly. If the stains are really stubborn, mix one part bleach to 40 parts water and spray the mixture on the grimy parts. Let it stand a few minutes before rinsing. Bleach can discolor aluminum so take a cautious approach. Always wear goggles and gloves to protect your eyes and skin. Do not stream water from a pressure washer as this can damage the screen. If the problem persists, then the final option is to hire a professional company that offers screen cleaning services. Instead of waiting for the weekend to clean your pool or patio, brush away debris as it comes. Clear twigs and leaves that fall out of trees and vines. 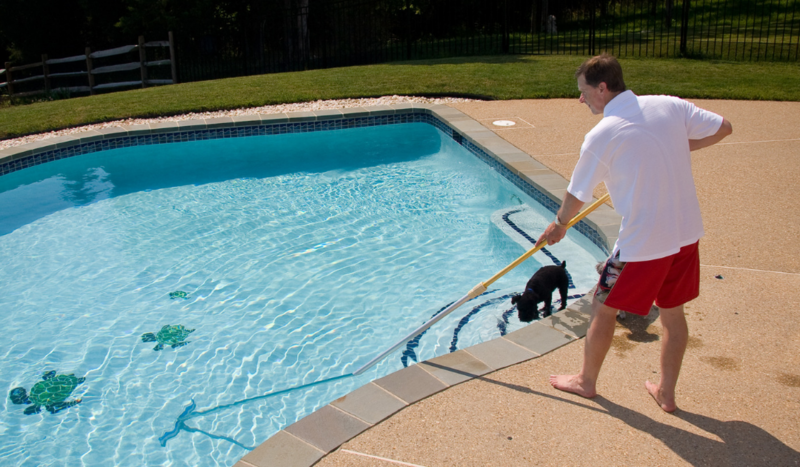 Remove debris from your pool with a push broom or pool skimmer. Trim the branches of overhanging trees regularly to keep them short and tidy. Choose a plant that does not shed leaves and seeds all over the place. Evergreens, monkey tail palm, and orange and lemon trees provide a nice shade without the backyard rubble. A soft wash means applying minimal to no pressure on the surface while removing dark stubborn stains with environment-friendly cleaning solutions. Contact Apple Roof Cleaning at 727-277-2524 for a scheduled cleanup. Professional non-pressure soft wash cleaning is available for residents of Pinellas & Pasco County, Tampa Bay, Clearwater, Largo, Redington Beach, Treasure Island, Tarpon Springs, Trinity, Saint Petersburg, Safety Harbor, Palm Harbor, Seminole, Oldsmar, and Pasco County. Apple Roof Cleaning will have your patio, pool, or deck looking new again.